See art and sculpture created by Chennai's old and contemporary artists. Observe how they see Chennai. The moment you step in you can actually feel calmness. Truly this is a spiritual place. You may not be a Hindu, but come for a while, and be transpoted into another world. 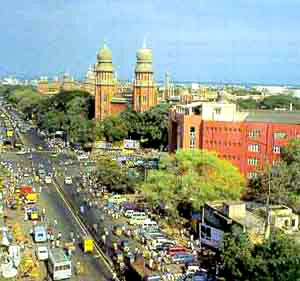 Chennai can be considered a multi-faith city. A shrine dedicated to a Tamil poet, Saint Thiruvalluvar. Another temple, this is one that deserves applause. It is regal, and majestic, and here you will get to meet priests at work,as they help heal and comfort the needy. Over twenty acres surrounds this center of science education and awareness. Two of its popular features are Periyar Science & Technology Centre and the Birla Planetarium. This modern planetarium is part of the Tamilnadu Science and Technology Centre. Find out more about the stars, and how the world was created. Who knows, you might see a spaceship pass by. Since its construction over two hundred years ago this building has been a British officers' hall, a jail and a residence. It is now home to administration offices of the Women's Christian College. This majestic complex comprises six buildings and nearly fifty galleries. The impressive works cross every era and branch of science and art, from zoology and anthropology to puppetry, painting and fibre optic sculpture. In addition to over thirty Indian snakes, this specialty zoo is home to domestic and exotic crocodiles, turtles and tortoises. A library and museum are also on site. If you like slithery things, visit the Snake Park.